Russellville’s Lee Dockins completes her clubs routing at the 2019 World Games in Abu Dhabi. Just as fellow Kentucky gymnast Tonya Cornett’s World Games competition was preceded by an exciting meeting, Russellville gymnast Lee Dockins had a busy morning before she competed in the finals of the rhythmic gymnastics competition in Abu Dhabi. While Cornett (along with Dockins and the rest of the USA gymnasts) met Second Lady Karen Pence, Dockins spent her pre-competition time with old friend Julie Foudy. Foudy was shooting a segment with Dockins and fellow American gymnast Beth Olive for future showing on an ABC broadcast. And just as Cornett’s day ended with the Lexington gymnast winning five medals, Dockins earned five of her own – four silvers and one bronze – in her first effort at rhythmic gymnastics at the World Games level. Dockins had an outstanding day at the Abu Dhabi National Exposition Centre, improving nearly every score from Monday’s divisioning round. She scored 13.15 in the ribbon, which matched her divisioning score, and added a 14.1 in hoop, 13.312 in ball and 13.4 in clubs. Her all-around score was more than three full points higher than she posted yesterday. Dockins finished second in three disciplines to Canada’s Amber Harriman, who dominated the competition with scores of more than 16 in every event. 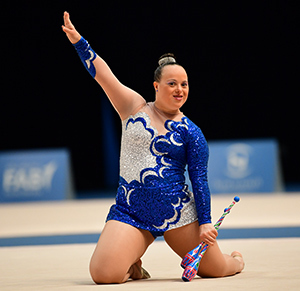 Special Olympics Greece gymnast Christina Douka claimed silver in ball with a score of 13.377. Alejandra Duarte of Costa Rica took silver in the all-round, just ahead of Dockins. Douka and Duarte split the remaining bronze medals. The five medals bring Dockins’ career World Games medal count to 17. She won 12 medals, including eight golds, in artistic gymnastics in World Games appearances in Shanghai in 2007, Athens in 2011 and Los Angeles in 2015. She is the most decorated World Games athlete in Special Olympics Kentucky history. The leotard she wore at the 2007 Games was recently displayed in a Special Olympics 50th Anniversary exhibit at the Smithsonian’s National Museum of American History. Dockins will receive her medals tomorrow during awards ceremonies at the Exposition Centre. The awards are streamed live via YouTube from the World Games web site; however, they do begin at 1:30 am Eastern, 12:30 am Central. They will remain on the site after the presentations conclude. All that is left for the Kentucky athletes is the Closing Ceremony at Zayed Sports City Stadium on Thursday. The Closing Ceremony gets underway at 8 am Eastern, 7 Central. The pair, along with head Special Olympics USA gymnastics coach Mary Fehrenbach, will begin their journey home on Friday, March 22, and return to Louisville on Saturday, March 23. The 2019 Special Olympics World Summer Games are being held March 14-21, 2019, in Abu Dhabi. It is the first time the World Games have been held in the Middle East. The Games are bringing together more than 7,000 athletes from 170 countries to compete. This is the fourth time that the World Summer Games have been held outside the United States. The others were in 2003 in Dublin, Ireland; 2007 in Shanghai, China and 2011 in Athens, Greece. For more information about the World Summer Games, or how you can support the Kentucky effort, please contact President/CEO Trish Mazzoni at 502-605-8222 or tmazzoni@soky.org.